This is a drawing commemorating the Storyteller Carl Barks. It has been made especially for this website and it should be seen as a more than 50-year old snapshot of The Master sitting at his desk getting ideas for his stories from his trusted Disney characters. 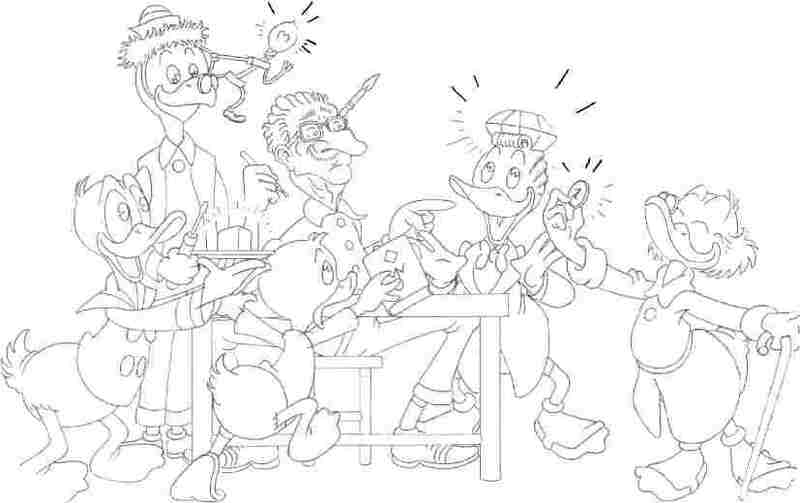 We can see Donald presenting a square egg on a plate, Gyro with his greatest invention, Little Helper, beaming over Carl's head, and a nephew eagerly holding up his Junior Woodchucks' Guide Book. Gladstone is displaying his luck by balancing a gemstone on his head, and Scrooge proudly presents Dime Number One! The creation of the drawing was a joint venture between the editor - who came up with the ideas needed - and Boudewijn Simons who single-handedly produced the very complicated artwork. 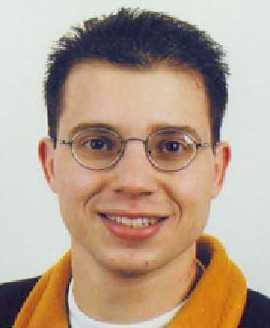 Boudewijn Simons, who was born in 1977, is from Holland and lives in Maastricht. 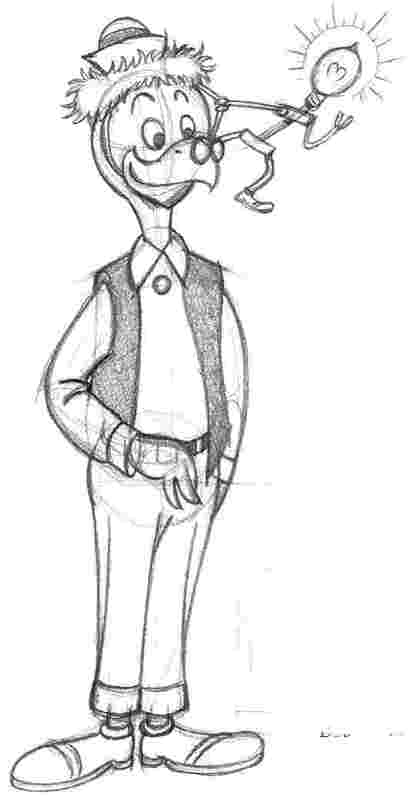 He has just finished lawschool and plans to be a lawyer, but his hobby is drawing the Disney ducks. 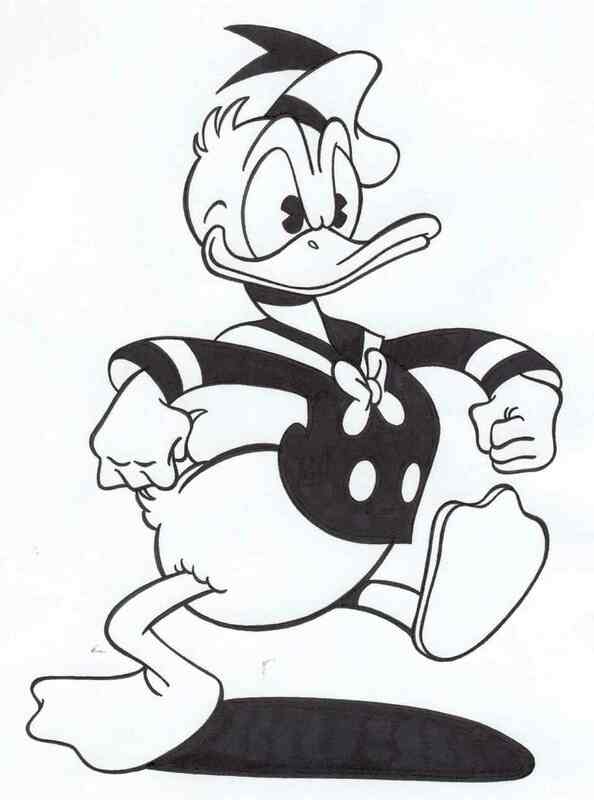 He has done so from childhood in the style of Carl Barks whom he consider to be the best duck artist. 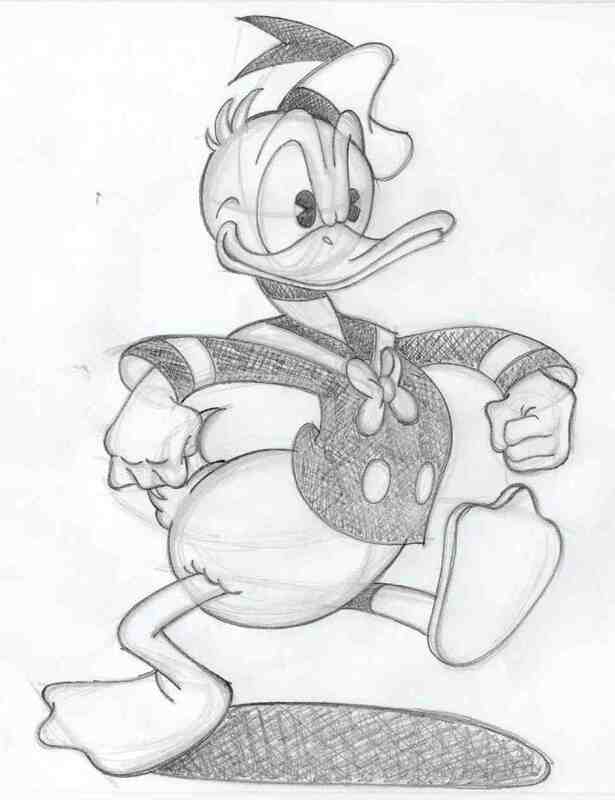 In 2001 Simons was invited to draw a one-pager for the Dutch Donald Duck magazine, and since then he has occasionally been contributing ideas and drawings. See more on Simon's various activities HERE. 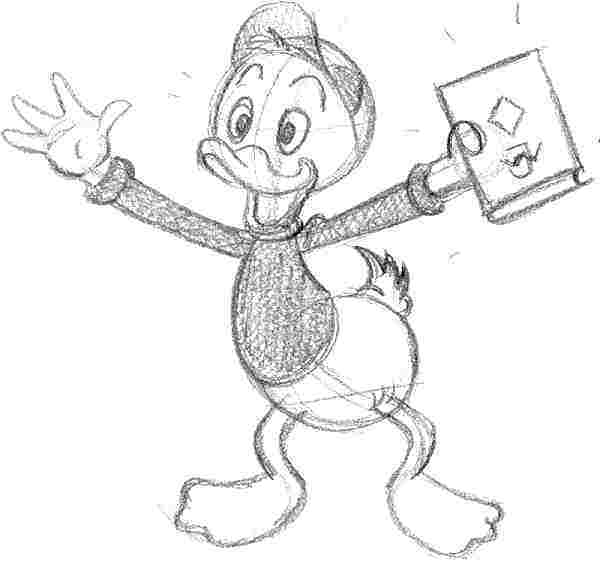 Start by making a rough sketch of Donalds head with a soft pencil. As you can see, it is shaped like a big circle. You may add his eyes as well. Now draw his spine, the so-called action-line. It has to be arched (like the letter S), because otherwise Donald looks too much like a stick! After that you can sketch his body, which has the shape of a pear. Add his arms and legs. Be aware of all the proportions! 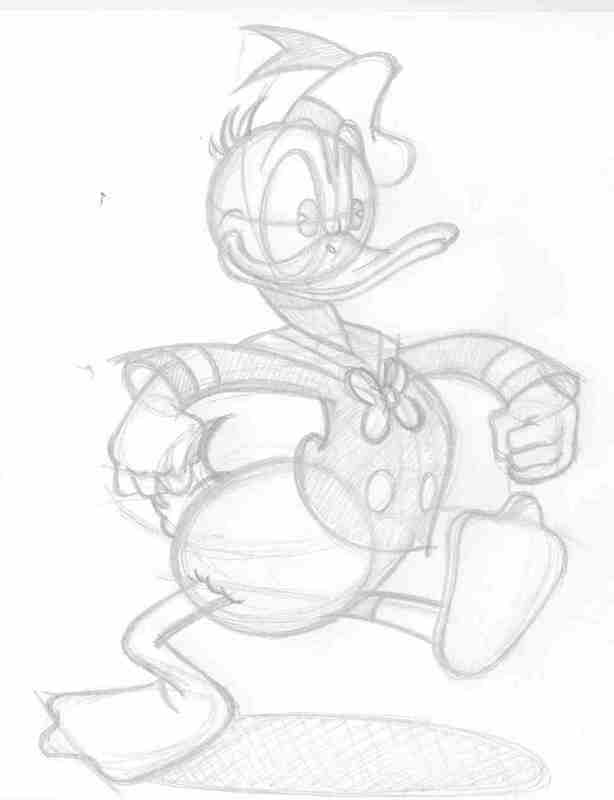 If you are fully satisfied with Donalds wire-frame body or skeleton you can start to work at your drawing. Be aware of all the details: Donald has only three fingers and one thumb on each hand. And dont forget the two buttons on his jacket! When you have filled in all the details, your drawing may look a bit messy. If so, draw over the most important lines with a harder pencil (for example a HB pencil). Next comes the inking part. You may use anything you like: a pencil, a brush or whatever you prefer. Personally, I use the Edding 1800 profipens #0.1., #0.3 and #0.7. I also use an animation board to trace over the pencil lines on a clean sheet of white paper, but you may stick to your original pencil drawing and erase the pencil lines after the ink has dried. Dont forget to fill in the black parts. Good luck!